A Guide to Kid’s Shows! You think I’m being silly, but in all my years as a graphic designer, there’s one rule that always rings true and strangely enough, applies to what shows you let your kids watch: If you’re presenting a client with options, never give them an option that you hate - Because that is the one option they will love. Now excluding all of your dumb friends on Facebook and Instagram who do nothing but brag about how their kids never have screen time and they’re always posting happy family pictures of them in parks and on hikes and eating granola out of troughs in some remote Vermont location, the rest of us know that screens are your only hope of keeping your wound up, bratty kids occupied long enough so you can take a 5 minute dump without having to run out of the bathroom mid-wipe with your pants around your ankles to yell at your little ‘angels’ who can’t agree on what color lego castle they’re going to build without slapping each other around like a couple of town drunks. Run-on sentence? Maybe, but it’s just what I’m used to listening to all day in a house where we’ve been attempting to reduce screen time. Anyway, like I was saying - screens good, noise bad. But this approach can very quickly backfire on you if you’re not careful. Remember, the purpose of television is to keep your kids quiet, but what’s the point of your kids being quiet when you’ve hastily picked the first colorful show you could find and now you’re listening to 4 grown Australians singing about what it’s like to be a Jack-in-the-Box?? EDUCATE YOURSELF! Sanity is on the line! Because there’s a million shows out there to get suckered into, I’ll just go over 2 for now, a bad one and a tolerable one. I might make this into a series I do… I’ve got 5 years worth of children’s programming eating away at my brain, I might as well write about it. Remember all those fond memories you had watching Mr. Rogers Neighborhood growing up? The soothing voice and welcoming face of a man everybody wished was their grandfather serenading you while he puts on a colorful sweater and brings you to a magical land of make-believe? … Yeah, he’s dead now and all we’re left with is this oversaturated, poorly animated bastardization of a children’s classic. Daniel Tiger takes place in the infamous Land of Make-Believe and it stars the son of Daniel Stripéd Tiger (also named Daniel) as he learns how to not be such an obnoxious, spoiled twerp. The show takes some liberties with the classic content. Daniel Tiger’s dad, whom the show refers to as “Dad Tiger” is the grown up version of the Mr Rogers’ character Daniel Stripéd Tiger - who if any of us remember, was a shy, softly spoken kitten who lived in a handless clock tower. Evidently he’s gained some confidence, learned to talk like a man and got himself a wife and kid. Now he lives in an actual house and works at the clock tower doing who knows what – the clock has no hands, what could he possibly be doing in there? I can only imagine it involves lipstick and a skin-suit. The majority of the other characters from Mr Rogers are all grown up now as well and have annoying kids of their own for Daniel to barely get along with… Except for the mailman who evidently never ages and is cursed to live alone for the rest of his immortal days. The only original character who I haven’t seen make an appearance is Lady Elaine Fairchild, and for what it’s worth, excluding her was probably a smart move - her puppet was made of tears and nightmares. Yeah, this is the number one reason you should NEVER PLAY THIS ON YOUR TV. They pick a crappy jingle about some common sense thing, like brushing your teeth, and then they sing it OVER and OVER and OVER and OVER AGAIN. I still have episodes burned into my brain from overexposure to that show. One song in particular was just a bold-faced lie. “Grown ups come back”… As in if you’re upset about your mom or dad leaving the house, don’t worry, grown ups always come back! 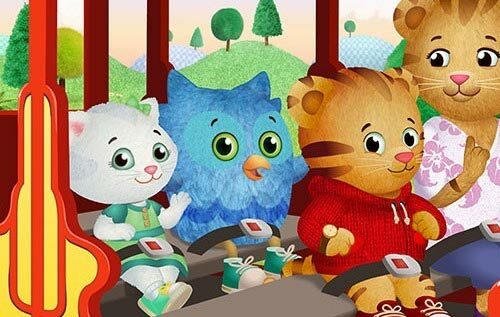 In addition to the repetitiveness of poorly written songs, the main reason this show will get on your nerves is because Daniel Tiger is literally the cartoon equivalent of a real-life toddler. It sounds mean to say, but think about every cringe-worthy, obnoxious thing your kids do, now imagine having to watch an entire television show where your main character does exactly those things. The whole reason you’re letting them watch TV in the first place is to escape the harsh but undeniable reality that toddlers are the worst! Now, granted, the point of the show is to teach your kids that everything they do is irritating and they should just stop, but would it kill the producers to use a hint of metaphor? Perhaps a whimsical, make-believe anecdote that teaches a similar lesson? This is the land of make-believe isn’t it?? Why is it so freaking real??? I’m not going to pretend that Super Why! is a good show (children’s entertainment is rarely, if ever, capable of reaching that standard), but it is an incredibly harmless show - which is the most any burnt out parent can really hope for. As I alluded to a moment ago, the show takes place in the magical land of Storybook Village, a place where all of our favorite fairytale characters live together in harmony. It exists behind some tiny door inside of a real-life children’s library on a shelf that I imagine kids can’t reach because you know if they found out about that door they’d burn that library to the ground to get at it. I always knew I’d find a way to write about kids burning books like a bunch of little fascists. Shark jumped. Similar to Daniel Tiger, some of our main characters are relatives of more popular characters from children’s stories. Our title character, Whyatt Beanstalk (AKA Super Why) is the brother of Jack Beanstalk from Jack and the Beanstalk… who I’m pretty sure never actually had Beanstalk for a name. Our other characters consist of Princess Pea, who is the daughter of the princess from The Princess and the Pea (who must be a queen now? ), Alpha Pig, who I think is one of the 3 little pigs, and Little Red Riding Hood. Clearly somebody was drunk when they came up with this cast. Why have the brother of Jack and the daughter of Princess Pea, but then just throw in the actual characters of Little Red Riding Hood and one of the 3 Little Pigs? Just use Jack and the original Princess! It makes no sense, I don’t like it. They eventually get a dog named Woofster who joins their little brat Justice League. He offers nothing to the show and his name is dumb. Let’s just get a cat on the show and name him Meowey while we’re at it. … Come to think of it, if they could get a wisecracking cat named Meowey Mandel that’d be PHENOMENAL on so many levels. I’m writing to PBS after this. Anyway, they all have special reading powers which they use to solve mysteries. The basic setup of every episode is one of them has a problem, they’re too dumb to figure out how to deal with said problem, so they transform into superheroes and journey into fairytale books where they solve a mystery and then apply what they learned to their insignificant real-life situation. 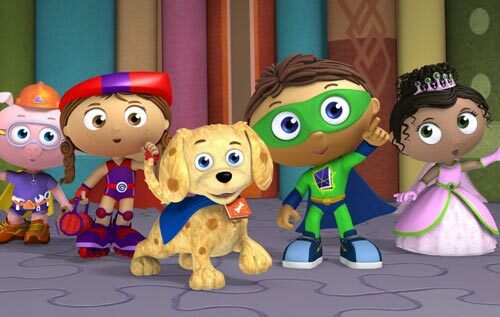 Super Why has the power to read, Princess Pea has spelling power, Red Hood has word power, Alpha Pig has Alphabet power and Woofster uses a dictionary. Based on those powers, it sounds to me like they all have the power to read. Why waste money animating 5 of these stupid characters? Scrap 4 of them and put that budget into better writers. Ignoring the fact I’ve done nothing but pick on this show, it actually won’t really bother you. Everything that annoys me is annoying because I’ve made the mistake of paying attention. You should NEVER pay attention to what your kids are watching. I see no flaws in that advice. It’s a cute show. The jingles are catchy enough, the characters don’t act like bratty kids, and from a visual perspective it’s not offensive to the eyes (I’m looking at you, Bo on the Go… I could write 50 blogs about that Canadian abomination). The show is mostly CG, but when they go into the storybooks, all the people and objects are flat like they were made out of paper. It’s actually pretty creative. Well played, Super Why. It’s made by the people behind Blue’s Clues (Which I had hoped would have died horrible, embarrassing deaths by now, but alas, they’re still at it) and so there’s that element of characters talking to the viewers and asking them if they see items on the screen. I mean whatever, it engages your kids, but the adult in me is just like, “It’s right behind you. Turn around and look, you’ve got 4 other useless characters with the same superpowers wandering around the screen, why are you bothering my kids?” Before you know it my kids are yelling at the TV, I’m yelling at the TV and Super Why still isn’t turning the eff around! But while my boys are having a blast trying to help Super Why, I’m just getting ticked off and want to punch him in his little kid nuts. I guess TV won’t give you any peace and quiet after all. Take your kids on a hike.